I take every possible opportunity to extol the virtues of Cinefamily here in Los Angeles. Operating from the Silent Movie Theater on Fairfax, they remain the one place in town where you can regularly (that is to say, monthly) see a silent movie on the big screen, but they also go way beyond not only the description given by their venue, but also any description you could find for a contemporary cinematheque. 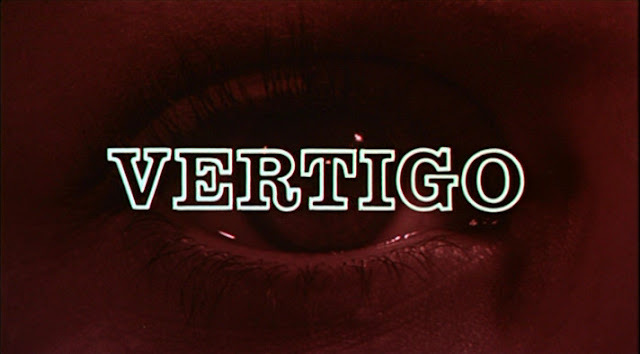 This past month alone, one could wander in and see everything from Bela Tarr's magnum opus Satantango to The Adventures of Buckaroo Bonzai to Celine and Julie Go Boating to Beyond the Black Rainbow to whatever Hamburger: The Motion Picture is. Never mind their live shows, potlucks, barbecues, and other add-ons designed to draw the community together. 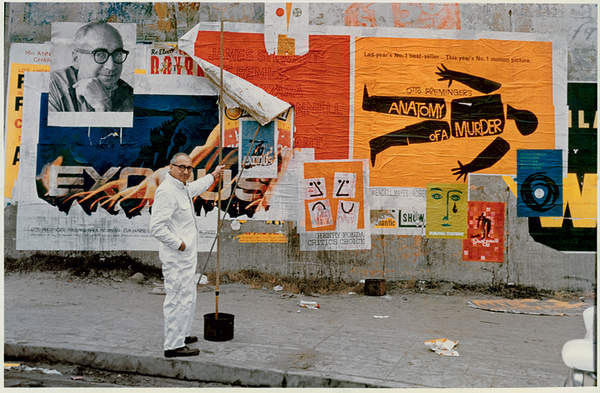 But they really outdid themselves this past weekend with a program titled Saul Bass on Film, a two-night retrospective of the famous title designer's work across film (short and feature-length), industrial films, commercials, logos, and cartoons. Prior to this weekend, I only knew Bass from his famous work on title sequences. It was fitting, then, to start out with the short lecture documentary Bass on Titles, which goes through some of the more notable ones and the inspiration therefor. This was playing as we entered the theater, so my attention wasn't exactly firmly engaged, but it provided a great recap of his range of influence, experience, and expression. Highlights included West Side Story, Grand Prix, Psycho, Vertigo, The Man with the Golden Arm, and more. From there, we were off to the races, drinking in a breadth of cinema that was quite striking, unexpected, and, most of all, inventive. His commercials of the era, mostly for beer, seem like they'd be right at home in the offices of Sterling Cooper Draper Price, with one detailing the sort of existential despair of office life in a city, making the daily routine of one worker into something as once noble and tragic (though he can always rely on a bottle of National!). Bass had an extensive career in logo design, creating some so iconic they're still instantly recognizable. In a nearly half-hour piece, Bass detailed the creation of the new face of AT&T (then still known as Bell System), going through every possible permutation of the concept for their new logo until they arrived at something sleek, simple, and instantly recognizable. It's a rather impressive process, one which loses a bit of steam in retrospect when they extol the virtues of stripes (noting that they denote something modern and efficient! ), which were ubiquitous on their company vehicles and other surrounding property. Cinefamily Executive Director Hadrian Belove, our host for the evening, introduced the short The Searching Eye by noting it was made for the 1964-65 World's Fair, and financed by Kodak with the intention of showing off their camera technology. It features a young boy moving about the world, discovering some basic facts of the world. The film was shot in a combination of 35mm and 70mm, and whenever the camera turned to what the boy was seeing - usually some form of wildlife - the film would blow up to 70mm. Even on 16mm, it was a pretty cool little movie, but I can't imagine how astounding it must have been to see it as it was intended. It points to an important current running throughout the films we saw this weekend, which is the belief that humanity is essentially positive, and progress essentially a noble movement in human evolution. The headliners for the night, if we knew what we were in for, were easily Notes on the Popular Arts and Why Man Creates. I'll attempt to account for the totality of the latter in a second, but the former did a fine job of dispatching with the current obsession with meta/deconstructive narratives that so proliferate modern culture. It illustrated how various mediums provide and encourage escapism, or the habit of removing oneself from the tedium of everyday life and traveling into the adventures of your favorite protagonists. So the kid who can't master his violin lessons becomes a superhero whose dissonant music foils a bank robbery. A woman unable to assert herself over an uncooperative receptionist imagines a version of herself who saves a political leader's life in surgery, thus preventing revolution, and moving right into a dramatic courtroom speech that exonerates her client and targets the real criminal. And so forth. Bass' sense of humor really came out here, finding a way to both mock and endear us to his characters, while still capturing the magic of art, the way it lifts us out of our lives, even if it's just cheap fantasy. Now...Why Man Creates is certainly an ambitious title. Doubly so for a half-hour film. And yet, mixing live action with animation (sometimes in the same frame), it's as close to a satisfying exploration of the topic as I can imagine. 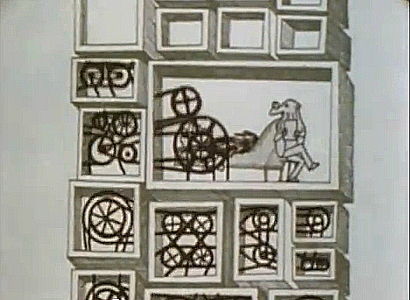 It's divided into eight sections, the first of which, "The Edifice," provides a very cursory, animated summation of man's creative - both industrial, artistic, societal, and political - accomplishments since pretty much our beginnings, culminating with what Bass depicts as an overwhelming, crushing confluence of creativity and industry. And this was only 1968! What would he have thought today? From there, he ruminates on the very conception of creativity and how it is received by the public. He asserts that no creator has total control over the end product. Outside influences, be they tangible (materials, funding, etc.) or ethereal (every artist knows the piece itself has a say on its final form), will always determine the piece as much as the artist. He doesn't express a great deal of faith in the public, as they look on at an unknown accomplishment with skepticism, disbelief, hatred, and mockery, except for one or two people who dare to say "I don't know, there might be something there." Through ping pong balls, of all things, he illustrates how those who stand out and are willing to take the greatest chances are cast out, then approached curiously, and finally revered. He takes a momentary digression to two snails, one of whom asks, "Have you ever thought that radical ideas threaten institutions, then become institutions, and in turn reject radical ideas which threaten institutions?" The other snail replies, "no," and the first one shrugs (insofar as snails can shrug) and say, "Huh, for a minute there I thought I was onto something." The penultimate section visits the offices of three researchers, one looking into a solution to the world hunger problem, another into a cure for cancer, and the third into the origins of the universe. The first thing a modern audience realizes is that these are still well beyond our grasp, which is especially heartbreaking given each man's assertion that they're a few years away from a solution. 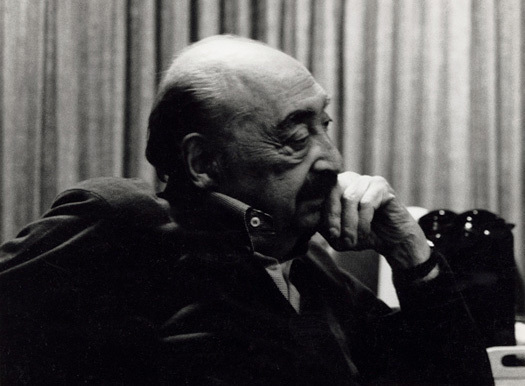 But Bass really cuts to the core of these sort of fields, which involve years of intense exploration into a particular hypothesis that can come up totally empty, epitomized as he follows one man whose seven years on one area came to a total dead end. It's a quietly heartbreaking note to (nearly) end on. His final answer to the titular question isn't one I'll give away here, not because I feel particularly precious for having seen it, but rather because you have to kind of go through the whole thing for it to have the appropriate impact, and also because it's blindingly obvious. Its clarity, however, makes it no less true or profound. Even at thirty minutes, it made a pretty deep impact on me in its investigation at this inherent driving force within humanity, and how, even when it tears us down, it gradually lifts us up. If only by the sheer fact of its existence. And prior to that, Belove sat down with with title designer Pablo Ferro (probably best known for working with Stanley Kubrick on the titles for Dr. Strangelove and the trailer for A Clockwork Orange, and for accomplishing the split-screens in The Thomas Crown Affair) and Bass's assistant editor for his titling work in the 1960s, Michael Lonzo for an extensive chat about all things graphic design. Lonzo was especially eager to discuss his working relationship with Bass, going into everything from his first interview for an office assistant position (which Bass conducted personally) to his unusual hours (Bass once scheduled him for a fifteen-minute meeting at the office at 3:30 AM) to his small contributions to the overall form. He recalled that Bass was incredibly tidy, and his desk was arranged "as if he himself had designed it," with pencilled pre-sharpened and placed in order of length. He insisted on talking about the title sequence for Seconds, and not without reason, as it's an elaborate sequence, especially laborious at the time it was made, involving shooting, printing, projecting, reflecting, and editing in various combinations. And that was the first night! The second night began with The Solar Film, an industrial short designed to highlight the importance of solar energy without being becoming a series of facts and figures. Bass nicely illustrates the impermanence of oil through an animated sequence, then moves into a really fine exploration of the positive feelings associated with the sun, and how those go hand-in-hand with renewable energy. Once again, Bass would have fit right in at SCDP. But the big attraction for the evening was certainly Phase IV, Bass's only feature, which hasn't enjoyed the best reputation since its release in 1974. While there's plenty to mock - the performances are pretty phony - Bass's cinema is exquisite. The film is essentially about a potentially deadly event which, instead of causing the end of the world, instead causes super-intelligence in ants. That sounds terribly lame, but in practice - through a long, nearly dialogue-free prologue showing nothing but ants - it becomes incredibly unnerving. Bass takes the human/ant dynamic and transforms it into something almost poetically haunting. It tackles such diverse and converging ideas as war, communism, the thin line between humanity and animals, and loss. 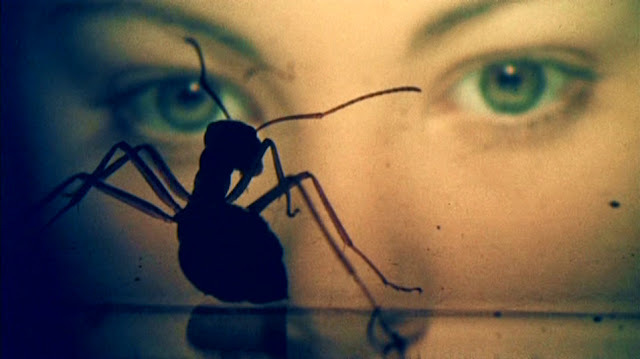 The ant photography, which was headed up by Ken Middleham (who provided similar services on Days of Heaven), goes beyond simply being an astounding piece of documentary to legitimately telling a story. His practices certainly wouldn't fly on an American Humane Association-supervised shoot - beyond gluing insects into place (a common practice), he arranged for them to be destroyed in numerous ways (eaten, squished, pierced, etc. ), and they even bred special ants for the purposes of the film - but the results are breathtaking, far more moving and stirring than the human drama. At the end of the film, we discover that the ants are terrorizing the humans not to destroy them, but rather to assimilate them as members of the ant family. 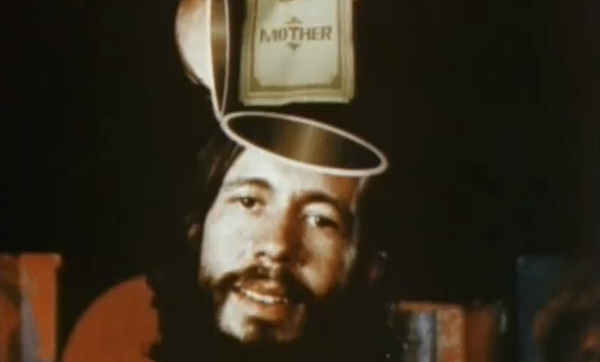 A short psychedelic sequence shows the mental collapse and rebuilding at the hands (legs?) of the all-powerful ants, but that sequence was originally intended to be much longer. Rumors have circulated since the film's release, most saying that it was cut by the studio who already didn't understand how their killer ant movie got transformed into a weird, slow, psychological trip, but some insisted it was never even shot. Well, shot it was, saw it we did, and it takes the film's inherent odd nature at catapults it beyond the infinite. Comparisons were immediately drawn to 2001: A Space Odyssey, but this is something else entirely, at once more focused and far stranger. Some of the imagery is fairly easy to read; humans are compartmentalized into mazes and containers, as we do to ants, then a man's foreheard is bored out from the inside, and finally humans take on the actions of hawks and frogs, becoming one with nature. Others are a little more eclectic - mirror imagery of a woman's swirling naked body, a(nother?) woman giving birth to the sun are a little more eclectic, and a man running across the water makes for some pure, visceral cinema. It's an absolutely stunning sequence, which would have taken an effective bio-thriller with hints of psycho-terror and body horror and really cemented its place in cinematic history. Phase IV could never have been a great film, but it has greatness in it. 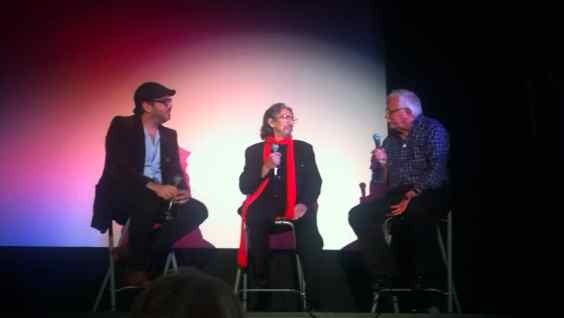 The evening concluded with 1984's Quest, a short film Bass co-directed with his wife Elaine (who Belove specifically noted had a huge hand in all of Saul's work, and anytime one talks about his accomplishments, it was important to remember Elaine was right there with him). The film doubled as a tribute to Ray Bradbury as well, as he wrote the story for the film, about a civilization whose people live only eight days. They still age as we do, but, you know, much faster. They send out a newborn to reach a gate that will open a new land where people live longer, and somehow through opening the gate their civilization will find hope, or something. That was a little unclear. What was clear is that this was an incredibly 1980s production, from the score to the titular adventure to the hair to the special effects (so many lasers), but Bass accomplished a tremendous amount on a tiny budget (George Lucas sent people from ILM to see how he rendered so much with so little), and came away with some incredible imagery in the process. 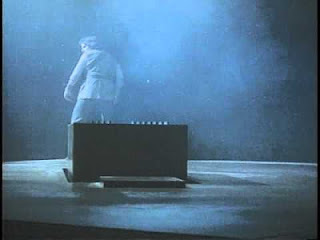 Including a man playing a chess-like game involving lasers with an ape creature. It was an astonishing, eye-opening weekend, to say the least. Phase IV will show again on July 1st (no mention of the alternate ending showing with it), and it's certainly worth experiencing on the big screen. As I mentioned at the top, this was a whole world of Bass's work, and thus of cinema, that I hadn't even glimpsed before, and I am certainly richer for it. Bass's intense interest in human progress, the belief that we can create a better world, permeated even the least of his work. 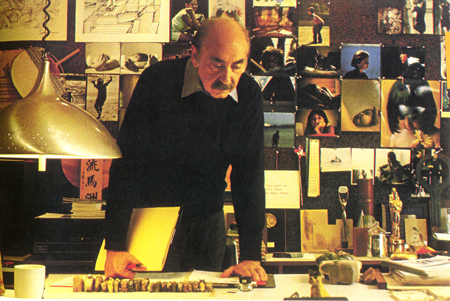 More than just leaving his mark on contemporary design, he made grand statements about the contemporary human condition.